In the kitchen with Executive Chef/Director Thomas Rode Andersen as he works his culinary magic at the Michelin star restaurant Kong Hans Kælder in Copenhagen, Denmark. Some chefs have enough passion to fire up the oven with their own energy; Executive Chef Thomas Rode Andersen is one of them. This man is passionate about all things culinary, his business and his two children, but he does have a bit of a wild side, which adds a perfect balance of spice to his already heady mix of inspired creativity. The name of the restaurant, Kong Hans Kælder translates as King Hans' Cellar, and if that is true, then Chef Thomas Rode Andersen is the Crown Prince. The restaurant is located in the oldest building in Copenhagen, the foundation is probably even older, as it is built on a fortress, and after 30 years, the restaurant owned by Lene and Sven Grønlykke, who also own the gourmand restaurant, Falsled Kro in Millinge, Hong Kans Kælder has a long-standing tradition of being on the "hot" list of restaurants in Copenhagen. Thomas joined Kong Hans Kælder in 1997, and is only the third chef at the restaurant in 30 years, which in the often-revolving door of personnel at restaurants is quite an accomplishment. This Danish born chef's impeccable résumé includes working in Austria outside Salzburg at a 2-star Michelin restaurant, working in Germany at Chez Paul, working in Copenhagen at Kanalen as the Head Chef, and working as a Sous Chef at Falsled Kro, where at the end of the season, the owners asked him if he would like to take-over Kong Hans Kælder. Believe me, having eaten at the restaurant in May 2006, Copenhagen is glad that he did. 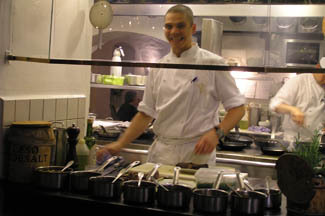 Thomas said that the culinary emphasis at Kong Hans Kælder is Franco/Danish, because you can't leave out French techniques, but Danish gastronomy is open-minded. There is a new movement that kind of started at Kong Hans Kælder, which is considered to be a French restaurant, but tries to use Danish products, including wild herbs, etc. One of the most important things to remember is not to lose your own cuisine identity. Get the best of all, and make it your identity. Danish gastronomy is on the rise, there are 10 Michelin restaurants in Copenhagen at present, however he believes that there is the potential for 5 or 6 more. When not working in the kitchen creating new recipes for the restaurant or inspiring his chefs, he is at work on a project with other talented chefs to create a book about 3-star Michelin restaurants. I also found out that he had another passion, racing 1,000 cc motorcycles, enough said; there is more to Thomas Rode Andersen than just being an extraordinary chef. 4 "ready to cook" Squabs. Separate the breast and the legs from the carcases. Prepare a rich brown pigeon bouillon from the carcases, the trimmings and some vegetables, tomato purée and spices. You'll need exactly 2, 5 dl (10 ounces). Marinate the breasts in a little soy sauce, freshly chopped ginger, garlic and a teaspoon of honey or dark syrup. Wipe the breasts with a kitchen cloth, and smoke them for 45 minutes in cold smoke. Season the breasts and the legs with salt and pepper. Wash the white part of the leeks thoroughly and cut them in 5-cm (2-inch) long pieces. Place the legs and the leeks on a skewer in a pan; add the bouillon, the ginger, the ground coriander seeds, the curry, lemon juice and the Tamari soy sauce. Cover with a lid a cook in the oven at 175° C (350° F). After 35 minutes, place the breasts on top of the leeks and legs and put the pan back in the oven for another 12 minutes. Strain the sauce, and put the 2, 5 dl (10 ounces) in a saucepan and heat it to 75° C (175° F). Add the butter and the ginseng and mix the sauce to obtain a frothy foam. Adjust with salt and pepper and perhaps a little sherry vinegar. Before serving, remove the skin from the breast. Serve with compote of Jerusalem artichokes and pickled Shiitake mushrooms. 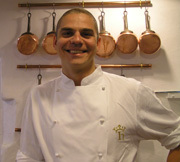 Read the article on Kong Hans Kælder in the Restaurants section.